The Trending on Stockwits alert is for the US (NYSE & Nasdaq) version of SwingTradeBot only. I've had StockTwits' trending tickers displayed on the site for several years now. These new alerts, if you choose to turn them on, will allow you to get alerted when YOUR stocks are trending on StockTwits. One difference with the StockTwits alert is that it will fire all day long. However, I'm only actually pushing notifications to phones between 9am and 6pm. 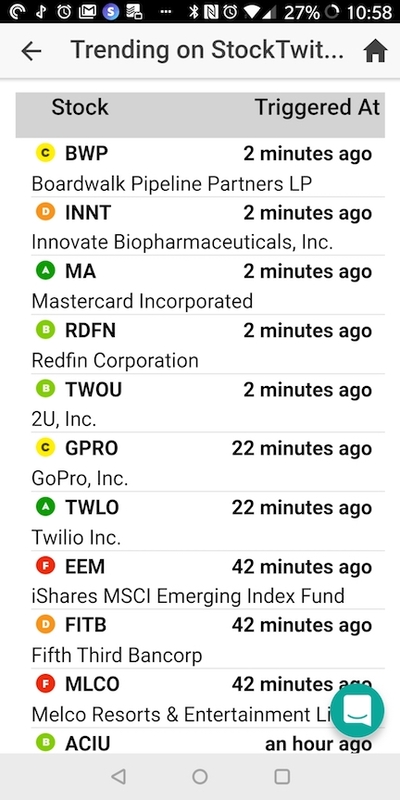 So the viewing the StockTwits Trending alerts list will be one way to see what's interesting during extended hours trading. Another person asked me about the Fell Below Moving Average and Rose Above Moving Average alerts. He was trying to get alerted to stocks that were bouncung off a MA during the day. I told him how I thought those alerts worked -- if a stock started out above a MA and then fell below, you'd get the "Fell Below" alert. Then if it rose back above, you'd get the "Rose Above" alert. But then I actually looked at the intraday alerts for some stocks and I realized that's not how I wrote them to work -- in that scenario, the "Rose Above" would NOT have fired because the stock was already above the MA the day before. So I decided to leave those alerts as they were originally written and create a couple of more alert types. So now there are some "Moving Average Support" and "Moving Average Resistance" alerts which will tell you when a stock gets rejected by a moving average. You can set those alerts for the 10, 20, 50 and/or 200-day moving averages. One thing I've been working on is the abilty to get alerts on any stock making a particluar intraday move. For example, let's say I wanted to be alerted to any stock making a new 52-week high. You'll soon be able to subscribe to an alert in that manner. In addition, the stocks will be filtered according to your own price & volume thresholds. So I can opt to only get notified of new 52-week highs on stocks which trade an average of 500,000 shares and are above $10 per share. I hope to release those soon. I've got them working but I *just* (ha!, it's no small task) need to build the user interface to manage them. I know it's sub-optimal to manage the alerts on the web instead of in the mobile app. It's on my to-do list to bring all the management in-app as well. However, I'm much less adept at mobile development vs. web development, so I get more bang for my buck by doing web first. Plus, the web server side needs to be done so it can provide data to the apps. So I'm going to carve out some time to build all the alert management into the apps as well. But it's likely that I'll release the management on the web first. The Ultimate Mobile Phone Stock Market Portfolio App! ?